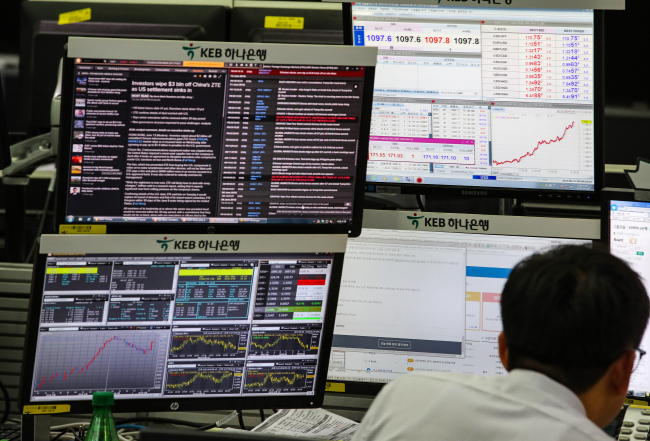 South Korea’s local currency fell for four consecutive trading days and breached a seven-month low against the US dollar, amid investor risk aversion and the strengthening dollar following growing fears of a US-China trade war. The dollar-to-won exchange rate came to 1,104.8 won in closing Monday, up 7.1 won compared to the previous session’s close Friday. The higher rate equals weaker won. The Korean won was the weakest in seven months since closing on Nov. 15, 2017 at 1,112.3 won against the greenback. Since Tuesday last week, the local currency has weakened by 29.6 won, seeing a surge in the exchange rate for four consecutive trading sessions. Markets closed in Korea on Wednesday for local elections. Also, the exchange rate topped 1,100 won for the first time in seven months. The Korean won had been on a constant downtrend the previous week, on the back of the hawkish US Federal Reserve, coupled with the dovish stance posed by the European Central Bank to rule out the possibility of a rate hike until mid-2019. Moreover, anticipation among investors for a North Korea thaw has been on the wane since the US-North Korea summit took place on June 12. Calling the weakening trend a “collapse in the upper resistance level,” the looming US-China trade war concern is expected to add pressure on the local currency, wrote Jeon Seung-ji, a forex analyst at Samsung Futures, in a note Monday. “The foreign exchange rate will establish a floor at 1,100 won this week,” Jeon wrote, adding that external factors such as actions or remarks by central bank governors or financial authorities would adjust the pace of the irreversible trend. On Friday, US President Donald Trump announced in a statement plans to levy 25 percent tariffs on $50 billion of Chinese goods, while China vowed retaliation through tariffs on US goods. Such actions would “trigger a risk-averse approach of investors,” leading to a stronger dollar and weaker won, according to Kim Yu-mi of Kiwoom Securities in a Monday report. Investors’ risk-averse trend also emerged on stock markets. As a result, stock indexes drifted lower Monday. The top-tier Kospi slid 1.2 percent, marking a drop for four consecutive trading days since Tuesday. The second-tier Kosdaq sank 3 percent, the largest intraday drop since May 8.